Pile testing as a NDT-CE (non-destructive-testing in civil engineering) method provides information about the condition of foundations. It is also used as a tool for quality control. Real size test fields with sound piles, piles with flaws and piles connected with a foundation allow calibration of measurement devices and method comparison under "real" conditions. Such a site is planned on a BAM testing area south of Berlin. The joint use facilitates the establishment of the testing site as a national or European reference site. Due to the decreasing average economic life time of buildings on urban sites there is a need for the re-use of foundations from old constructions. The re-use of these components means faster construction time, less strain of the foundation soil avoiding drawdowns and saving resources. Nondestructive testing methods have to provide information about the type and geometry of the construction and the state of the material as input for load capacity calculations. So pile testing as a method for examination and assessment of new and existing foundations gains an increasing economic role. Furthermore quality control of new foundations is a field of application. Pile testing can also contribute to cost savings. Efforts should be taken to investigate dynamic pile testing to reduce the amount of elaborate and cost intensive methods like pile load tests. Pile testing methods like integrity testing or crosshole sonic logging are used in many countries but only a few countries provide national standards or recommendations . A European standard should be developed. 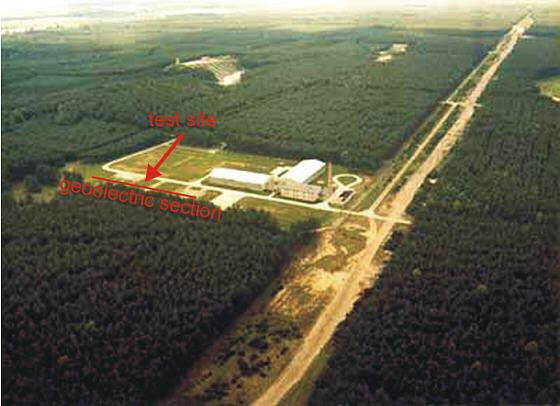 In the United States there are several test sites operated by the NGES community . Measurement and interpretation methods are standardized by ASTM D5882-00 (low strain) and others . But like in Europe there are no regulations on where, when and by whom such tests have to be performed. Some recommendations of industrial or scientific organizations exist . In Europe there are several small-scale test sites, in most cases built and operated by the construction industry, but most of them have access restrictions. Fig 1: Part of the BAM-site at Horstwalde. The planned test site is on the lower left corner of the green. A real size test site consisting of bored piles connected with a foundation slab is currently under development at the testing area of the Federal Institute for Material Research and Testing (BAM) in Horstwalde (figure 1) . Together with partners from other research institutions, engineering companies and the construction industry a concept for long term investigations has been developed. In addition a reference test site for displacement piles including sound piles and piles with flaws and/or geometrical anomalies is planned. The accurate knowledge of the exact geometry and structure of the piles allows calibration of measurement devices or method comparison. Measurements at the new test site will facilitate the development and improvement of assessment methods for piles and enhance the reliability. In the EC funded research project "Re-Use of Old Foundations on Urban Sites" (RUFUS) essential studies will be performed at Horstwalde. The test site will be accessible for research organizations, consultants, equipment manufacturers and the construction industry. On a mid-term scale the site should be developed to a national or European reference pile testing facility and will contribute to the training of professional operational personnel. The extension of the existing facility and the construction of further reference testing sites representing certain subsoil conditions are intended. To ensure the development of a test site to a reference test site the investigation of the subsoil is the first part of the work. Subsoil conditions must be representative for the planned structural members such as piles or foundation slabs. Fig 2: Result of geoelectric section at test site. The BAM-site is located at Horstwalde, a former military training site approx. 50 km south of Berlin. The area belongs geologically to the Luckenwalder heathland and is bordered from the Baruther glacial valley in the south and from the Nuthe-Notte-lowland in the north. Some shallow boreholes show sand with fine to medium grain size but high glacial compaction. A silt and marl layer is expected in about 30 m depth. The groundwater table is 3 to 4 m below surface. To prove these conditions, geoelectrical investigations have been carried out in March 2003. Two Wenner-sections (98 m long, 2 m electrode distance) were measured across the test site (figure 2). The subsurface resistivity distribution beneath each profile was reconstructed by 2D inversion. The result for one of the sections is shown in figure 2. Between 0m and 4m below the surface resistivities are atop 1000 Wm (colour code red). This is typical for dry sand. In a depth of about 4 m the resistivity is steeply decreasing. This marks the water table. Resistivity values of about 100 Wm are quite normal for water-saturated sand with medium grain size. Fig 3: Result of CPT test at Horstwalde. Several CPT test have been done by one of our partners, Grundbaulabor Behnke. Figure 3 shows a typical result. Near the surface the cone pressure is nearly 30 MN/m2. Thus the situation at the Horstwalde test site is suitable for the construction of a foundation slab connected with bored piles, but for driven or displacement piles a different geological setting is needed. Sites near Berlin and in northern Germany are currently taken into account. At the Horstwalde site a foundation slab with a connection to bored piles will be established (figure 3). The slab will have two different sections from 0,70 m and 1,20 m thickness and one area with a strip foundation. Bored piles will be connected under the bottom line of the lower section. The reinforcement ratio will be varied from no reinforcement up to reinforcement ratio from real foundation slabs. Main focus of applied NDT-CE techniques will be on the signals received from areas with variation of the reinforcement ratio to investigate the slab thickness. Furthermore it will be investigated if piles can be located beneath the slab and if the piles can be tested through the slab. A variation of the bonding conditions is provided in the joint between the upper and the lower section to find out if this has influence on thickness measurements. The chosen location on the BAM-site allows enlargement of the test site. The equipment of the test site (figure 4) contains in its first stage two groups of displacement piles five piles each. The piles will be arranged to carry out static load tests. Adjacent piles will serve as reaction piles. There will be at least one sound pile while the others contain flaws representing gravel pockets or loss of section. Considered processing methods for cast-in-situ piles will be the so-called Franki pile (compacted and driven pile toe) and Atlas pile (screw shaped pile formed with a displacement auger). Fig 4: Design of the foundation slab with bored piles. All construction elements will be equipped with sensors for temperature, strain and vibration. So a correlation between a performed testing method and the gained data from the implemented measurement devices is possible. Polyethylene-cased boreholes near the piles will allow measurements with downhole sensors and/or receivers. A future extension of the test site will be possible. Fig 5: Design of the test site. Some of these tests will be performed by BAM, others by partners. The described test sites allow the research and development of non-destructive testing methods as well as reference testing of different methods or devices. The joint use facilitates the establishment of the testing site as a national or European reference site. R. J. Finno, Non-Destructive Evaluation of a Deep Foundation Test Section at the Northwestern University National Geotechnical Experimentation Site. http://www.iti.northwestern.edu/projects/found/dft.html, 1997. Geo Council, NGES - The National Geotechnical Experimentation Sites. http://www.geocouncil.org/nges/nges.html, 2003. ASTM, Standard Test Method for Low Strain Integrity Testing of Piles. ASTM D5882-00, 2000. German Society for Geotechnique DGGT, Recommendations for Static and Dynamic Pile Tests. Institut für Grundbau und Bodenmechanik, Technische Universität Braunschweig, 1998. M. J. Turner, Integrity testing in piling practice. Construction Industry research and Information association, CIRIA Report 144, 1997. E. Niederleithinger & A. Taffe, Horstwalde: Konzeption für einen Teststandort zur Pfahlprüfung. Proceedings of Pfahlsymposium, Braunschweig, 2003.